This Friday is National Dog Day. It is a day to celebrate all dogs – purebred and mixes – who bring joy to their owners or handlers lives. It is also a day to galvanize the public to recognize the number of dogs in need of forever homes. But most of all, it is a day to shower your dog with love and affection. 1. Homemade Treats. Every dog deserves a special treat now and then and you do not have to be a master chef to whip up some healthy and tasty treats for your dog. Oz loves when I make him his very own, single-serve Strawberry Banana SuperGravy Dixie Pups. He also loves Fruit & Yogurt Dixie Pups and I love both because they are healthy for him. Our friends at Sugar theGolden Retriever are great at creating fun and healthy dog treats. Check out their 25 Homemade Frozen Dog Treats Recipes...visit and you can even pre-order their upcoming book, Cooking for Sugar. 2. Play. 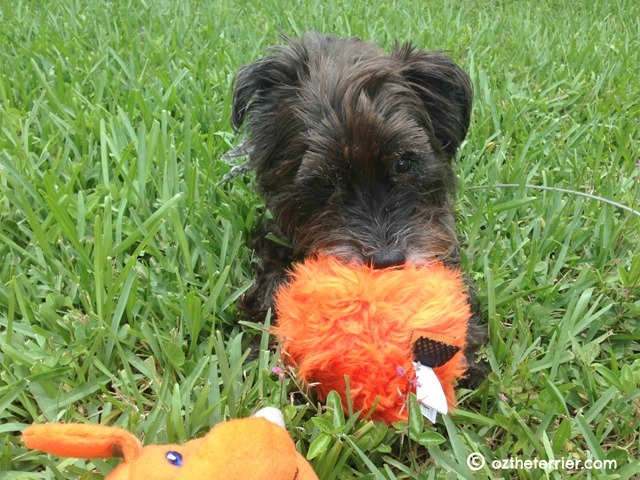 Even as a senior dog, Oz still loves to play. Whether we are chasing critters in the backyard or playing Chase Around the House, we have fun together and he gets needed physical exercise. For mental exercise, Oz and I play puzzle games like the Buster ActivityMat and NinaOttosson Dog Casino. And don’t worry if you don’t have a puzzle game, you can create your own like the Tennis Ball Cupcake game. 3. Eat Out. Are they dog-friendly restaurants near you? 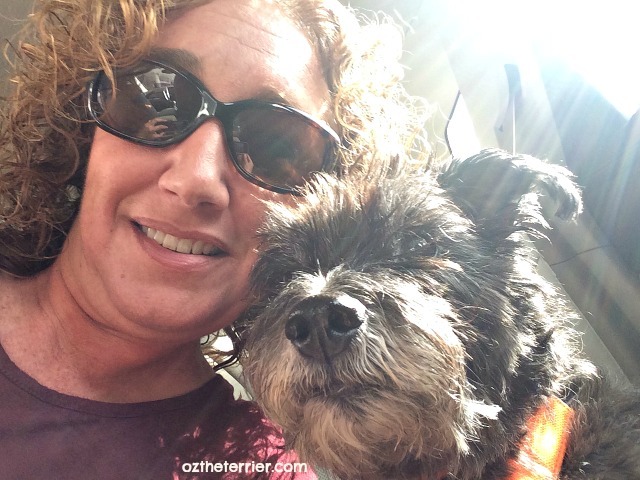 Oz loves going to dog-friendly eateries and restaurants with us especially if the restaurant has a Doggie Menu. 4. Out for Adventure. Oz has been on many adventures with us and he enjoys every minute exploring new places. The adventure doesn’t always have to be big, like when we go camping, it just needs to fun! A visit to a local park can be just as fun and exciting as a big adventure. Of course, if you plan to take your dog on an adventure for National Dog Day, remember to make sure to buckle up your pup! Did you know most car accidents take place within just 25 miles of home? 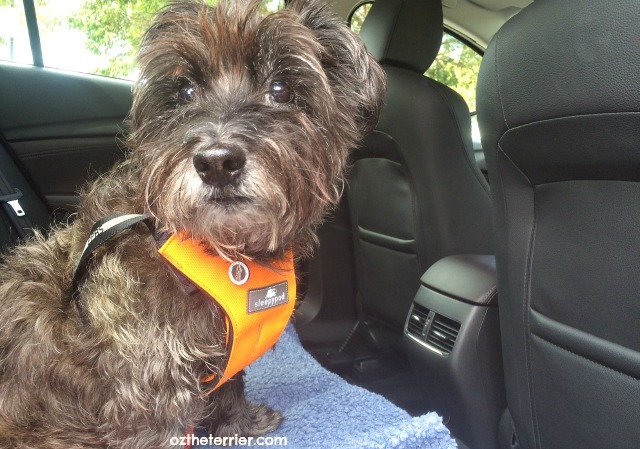 Thankfully, we have never been in an accident but I always know Oz is safe when traveling with us because he always wears the Sleepypod Clickit Sport safety harness no matter if we are driving 100 miles or 10 miles. How will you and your dog celebrate National Dog Day? I'm hoping for ALL of the above!!!!! National Dog Day sounds like a great day for everyone to celebrate YOU, Oz! I'm hopin for some new toys! Happy National Cat Day! Today is Take Your Cat to the Vet Day. Ugh. We are hoping for a break in the heat. It should be national dog day every day don't ya think! I'm sure Mom will have us busy as bees like she always does. It's no wonder we sleep so much when we are at home! First of all, SHE says every day is Dog Day in this house. We'd love some extra walks especially at the sportsground! We will getting home from our vacation on Friday so we can't get the boys until Saturday. They will be properly spoiled when they get home. OMD! I miss them SOOOO BADLY!! Those are great ways to celebrate.